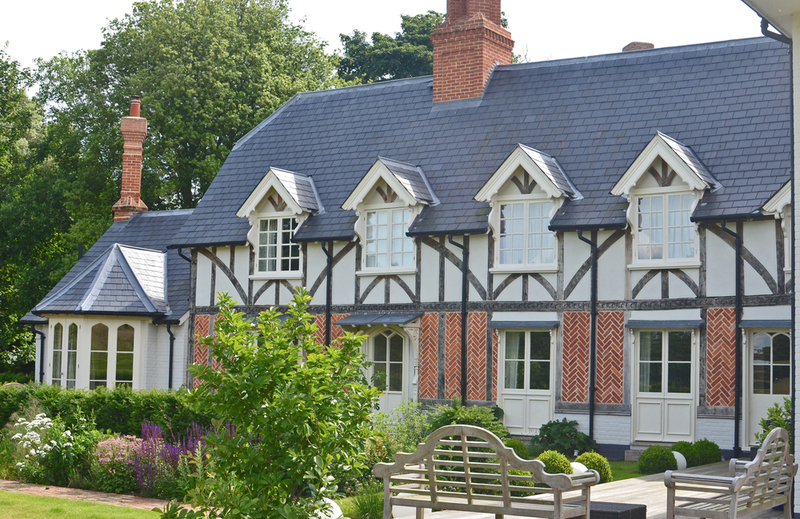 Sympathetic renovation and extension works of a private Grade II listed dwelling in Hasketon, Yew Tree Farmhouse combines contemporary with historic in an exemplary example of craftsmanship and design. Images showing the property prior to the refurbishment demonstrate the full extent of works which were undertaken to restore and revitalise the building. The extensive building and outbuildings which were in poor condition were renovated and sympathetically extended to provide an attractive family home. The windows and doors were retained and refurbished in the original style and the property has been painted in more sympathetic colours to provide a soft appearance. Extensive landscaping works were undertaken to enhance the setting of the listed building. The ogee skirting boards and mouldings were reproduced in keeping with the original features of the building and combined with the twisted staircase balustrading, provide an impressive and dramatic appearance to the main stairwell. A sympathetically designed extension was added, incorporating the original design features and style of the house. Interior Design: By-George Interiors & Lighting Design Ltd.